Audiopad is a beautiful app that does one task extremely well. It has proven to be a trusted companion to hundreds of users that have sent thousands of audio memos since the launch more than a year and a half ago. Sadly, Audiopad did not gain sufficiently wide traction to stay profitable in the long run. The Audiopad service relies on a server to forward the memos to the recipients, and the hard truth is that this server costs money to run regardless of app sales. I have reached a decision to shut down the Audiopad server by 31 Jan 2014. 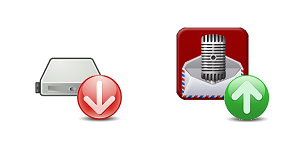 From then on, Audiopad will lose its mailing ability, but it will still work as a stand-alone audio recorder. I am truly sad to take a useful service away from the dedicated people who take advantage of Audiopad on a daily basis. But it’s a necessary move because putting money into a machine that doesn’t give at least as much money back just isn’t a sensible thing to do in the long run. I have thought about switching the app to a subscription system, but implementing a new version would add even more costs. A number of existing users would also abandon the app and not pay a subscription. This is not a solution to the problem. This leaves me with the choice I’ve made. I am very grateful to the users that Audiopad has attracted, and it’s been very satisfying to build something solid that is being used by lots of people all over the world every day. That is a good thing. Audiopad version 1.0 is ready!